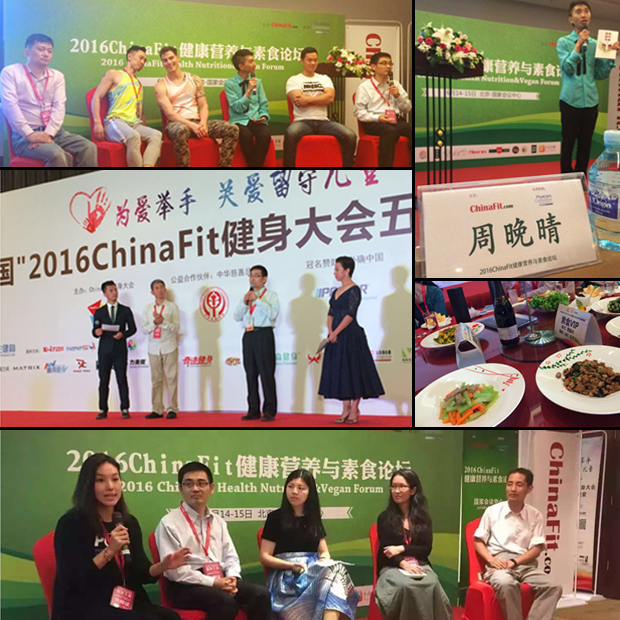 ChinaFit Expo 2016: Vegan Health Trending? Brighter Green Associate Wanqing Zhou traveled to China in June and attended the 5th ChinaFit Convention and Trade Show in Beijing. She was one of the lead panelists at the Health Nutrition & Vegan Forum. Wanqing reported that around 10,000 came to the larger expo and 180 bought tickets to the Vegan Nutrition and Health Forum. She shared her photos and experiences from her trip to Paraguay in November 2014 (including deforestation, soy plantations, and related struggles for indigenous groups), eco-agriculture in the U.S., and farm-to-table examples in Japan. She remarked that “people paid attention” and “some said they never thought about [these topics]…” For example, she mentioned how industrial fruit and vegetable plantations provide vegan foods but “might still pose negative environmental impacts,” but encouraged the audience that these same farms can implement eco-friendly practices to “get it right”and effectively feed the world. On the first day, the guest speakers talked about organic food, the environmental and social impacts of diet, experience from vegan restaurant owners, and vegan fitness and body-building. WANG Zi’er announced the release of the Chinese translation of The World Peace Diet by Lantern Books author Will Tuttle. 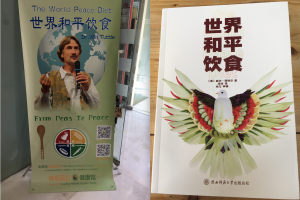 Each guest received a copy of the book (pictured to the right is a promotional poster and copy of the book at Vegan Hut in Beijing a few days later). Wanqing attended a charity dinner that evening, and all the food was vegan. On the second day, Wanqing spoke on a panel about industrial animal farming, which covered the history, food safety, animal rights, environmental impacts, social impacts, and implications for people and the government in China. She talked about What’s For Dinner? and the audience was so interested, the Q&A session went on for nearly an hour overtime. Hopefully there will be twice as many participants at next year’s vegan forum!